2013-10-27: Mukesh Kapila, “Against a Tide of Evil: Witness to Genocide in Sudan,” 5-7 PM, Temple Israel, 477 Longwood Avenue, Boston, close to the MBTA Longwood station. No charge.Dr. Mukesh Kapila was the top UN official in Sudan in 2003 and 2004. He will describe seeing the Darfur genocide unfold up close, what happened behind the news coverage and his efforts to make a difference. You’ll have a unique opportunity to hear not only about those who designed and orchestrated ‘the final solution’ in Darfur but about the global indifference and inaction that thwarted his attempts to stop the mass murder. It’s a personal story about one man’s fight to bring justice to those culpable and what made him act when no one else would. Mukesh recently visited Sudan and will bring us up to date on the continuing crises there.Doors open at 4:30pm. Parking garage at 375 Longwood Avenue for $7. Sponsored by Massachusetts Coalition to Save Darfur, JCRC of Greater Boston, My Sister’s Keeper, Armenian Assembly of America, Unitarian Universalist Service Committee, Temple Emunah, Temple Isaiah, Temple Israel, The Center for Global Judaism at Hebrew College, Sweder-Ross LLP and STAND. Color flyer here. B/W flyer here. After Mukesh’s talk, there will be a Q&A period for direct interaction. Mukesh will also be available to sign copies of his just published book about his experiences, Against a Tide of Evil. Watch this short video about the book. 2013-10-04: ***CANCELLED for 10/4 and to be rescheduled *** Jim McGovern: “From Sudan to Syria: Human Rights Issues in the 113th Congress,” noon-1:30pm, Northeastern School of Law, 60 Forsyth St., Boston 02115. A conversation with Congressman Jim McGovern, a leading voice on human rights in the United States Congress. Join us to learn more about the Congressman’s work – including as Co-Chairman of the Tom Lantos Human Rights Commission – and his perspective on current global conflicts and humanitarian crises. Pre-registration required, here. 2013-05-07: Waiting for Justice: Spotlight on Cambodia, 7:30 PM, Boston Public Library, Rabb Lecture Hall, 700 Boylston Street, Boston. Panel discussion with members of a recent Museum delegation to Cambodia that witnessed the trials of the last surviving leaders of the Khmer Rouge -Mike Abramowitz, Director, Center for the Prevention of Genocide, United States Holocaust Memorial Museum, Elizabeth Becker, journalist and author of When the War Was Over: Cambodia and the Khmer Rouge Revolution, Peter Canellos, editorial page editor, the Boston Globe, Thet Sambath, journalist and co-director of Enemies of the People: A Personal Journey into the Heart of the Killing Fields. Free but registration required. 2013-04-25: The Use and Misuse of History in Turkey: The Holocaust and the Armenian Genocide, 7:30 PM, Tilton Hall, Clark University, Worcester. Panelists: Corry Guttstadt, University of Hamburg, Ayhan Aktar, Istanbul Bilgi University, Turkey, Discussant: Seyla Benhabib, Yale University. 2013-04-21: Genocide: A Joint Commemoration – Armenia, Cambodia, Darfur, 2 PM, Armenian Library and Museum of America, 65 Main Street, Watertown, featuring talks by Kowith Kret, a survivor of the Cambodian Genocide, Eric Cohen, president of the Massachusetts Coalition to Save Darfur and Prof. Armen Marsoobian of Southern Connecticut University who will discuss the aftermath of the Armenian Genocide. Flyer here. 2013-03-1o and 03-11: Sudan Emergency Action Summit conference, George Mason University, Arlington, VA. Video of sessions available here. 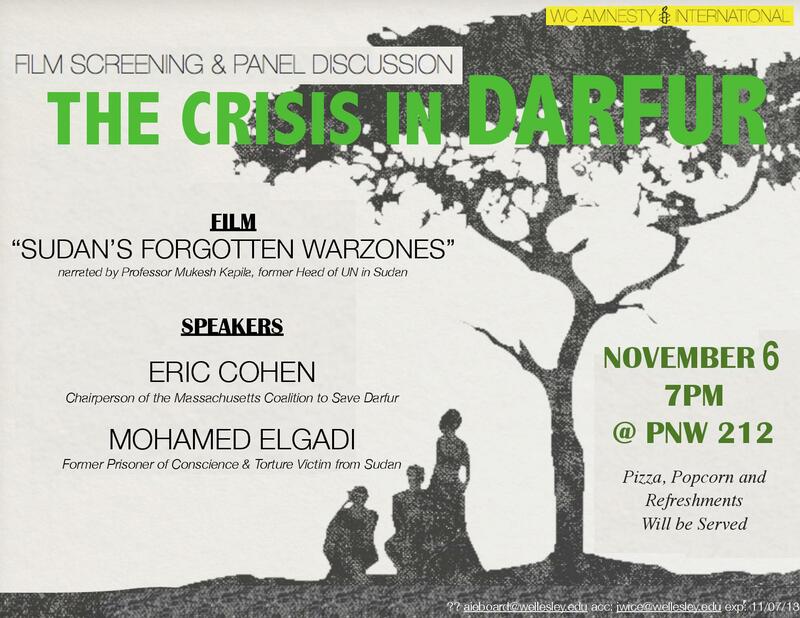 2013-02-23: Sudan film screening followed by guest speaker Mohamed Khalifa, 5:30PM, Tufts University, Pearson Hall 106, 62 Talbot Avenue, Medford.